ALTHOUGH in its later years the Carnarvon Castle music pub may have become little more than a relic to its glory years, former publican Hazel Pitman remembers the good times. 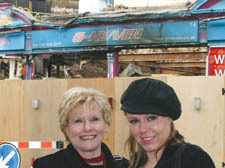 This week she visited what’s left of the Camden High Street pub after it was demolished for safety reasons last Tuesday – a victim of the fire that ripped through Camden Town. Mrs Pitman ran the Carnarvon – later rena­med the Caernarvon after its Welsh roots – with her husband David from 1975 to 1982. Her family lived above the pub. Under their stewardship the bar flourished, attracting crowds of around 300 at weekends as well as the odd celebrity punter including actor Bob Hoskins, singer Harry Nilsson, rockers The Clash and Soho great George Melly. The Carnarvon also became a favourite after work watering hole for traders of the fledgling market scene, which had just 30 stalls at the time. It later became a live music venue that regularly staged music acts, even attracting a young Sting.